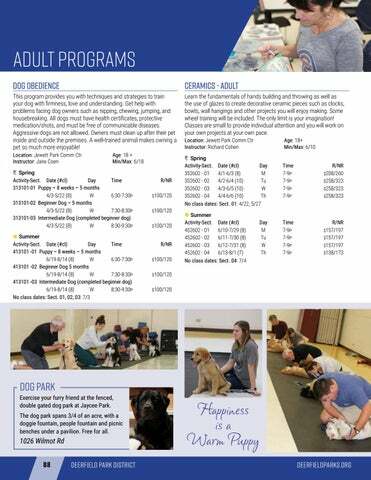 This program provides you with techniques and strategies to train your dog with firmness, love and understanding. Get help with problems facing dog owners such as nipping, chewing, jumping, and housebreaking. All dogs must have health certificates, protective medication/shots, and must be free of communicable diseases. Aggressive dogs are not allowed. Owners must clean up after their pet inside and outside the premises. A well-trained animal makes owning a pet so much more enjoyable! Learn the fundamentals of hands building and throwing as well as the use of glazes to create decorative ceramic pieces such as clocks, bowls, wall hangings and other projects you will enjoy making. Some wheel training will be included. The only limit is your imagination! Classes are small to provide individual attention and you will work on your own projects at your own pace. Dog Park Exercise your furry friend at the fenced, double gated dog park at Jaycee Park. The dog park spans 3/4 of an acre, with a doggie fountain, people fountain and picnic benches under a pavilion. Free for all. 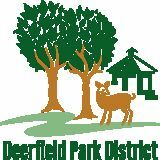 Browse various programs, events and more offered at the Deerfield Park District this spring and summer!